Yo, I iz on a camel. Sacha has been spotted filming for new film ‘The Dictator’ in the streets of New York City. 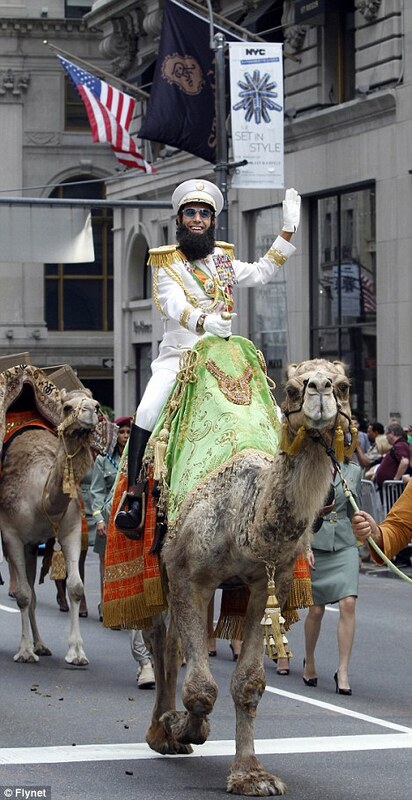 Pictures were taken of Sacha in his full Dictator gear riding a camel through the streets with a suitably large entourage. There are also pictures of Sacha, in more modest dress being tackled by a waiter after he steal food from an unsuspecting diner at a restaurant. The pictures do not give much away in terms of the plot, but it can be assumed the camel photos are of the Dictator before he meets his future love – the peasant girl whilst the photos of Sacha stealing food are when the Dictator hits harder times once his new love has reformed his dictatorial ways. Click ‘read more’ to see all the photos! Yo, check me out. I iz on a camel. I iz on a camel, being filmed. My beard is real, for real. Yo my camel got 20 inch rims. I iz Ali g.. I mean, crazy middle Eastern leader. Alo cheeky, is that chicken dippers me sees? Where do you think you’re going mate? Just saw “THE DICTATOR”. BRILLANT!!!! I have not laughed this hard in a very long time. Thank you.